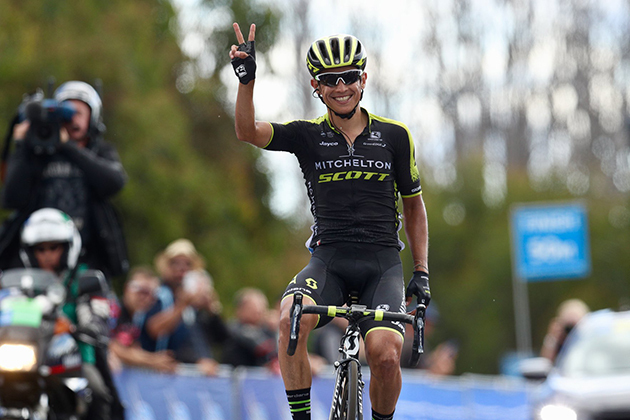 Mitchelton-SCOTT have guided Colombian climber Esteban Chaves to overall victory on the final stage of the Jayco Herald Sun Tour in Kinglake today. Chaves and teammates Cameron Meyer and Damien Howson finished safely in select front group to secure all top three positions overall for the home WorldTour outfit. Starting the day with a 32 and 39second buffer to teammates and former winners Meyer (2015) and Howson (2017), and 45seconds to his nearest true competitor in Ruben Guerreiro (Trek-Segafredo) it was a day of controlling for Mitchelton-SCOTT. After crashing yesterday, national champion Alex Edmondson joined Michael Hepburn and Lucas Hamilton for the early work, keeping a breakaway that swelled to 14 riders to a maximum advantage of around 90seconds. The race was back together on the final lap, just ahead of the final climb with seven kilometres remaining. Young climber Robert Power set a solid pace up the climb to discourage any late moves. A group of 17 reached the line together with Meyer sprinting to second place behind stage winner Sam Crome (Bennelong SwissWellness). Chaves and Howson also rolled across the line in the bunch to celebrate a clean sweep of the podium, plus the team classification prize. Esteban Chaves wins stage three. “It’s a really nice feeling to win here in the home country of the team. We are really happy with the team, we rode really well. We raced this year different, every climb was full gas with the breakaway really close. It was intense but the team did very well so thanks very much to all of them. It is unbelievable to have one, two, three overall. “It was a really exciting finish and I am just as happy as I was last year as we have my Colombian mate finishing the job off today taking the yellow jersey after his superb ride yesterday. Successful Aussie Summer: Today’s result wraps up a successful Australian summer which included eight victories across the men’s and women’s teams. 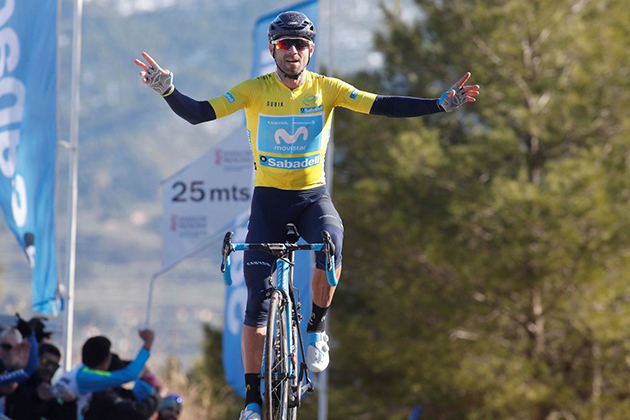 Alejandro Valverde and the Movistar Team took a brilliant 69th Volta a la Comunitat Valenciana to a good end in the streets of the region’s capital on Sunday. The Telefónica-backed squad flawlessly protected its team leader during the 135km stage five, from Paterna to Valencia, with a dangerous bunch sprint defining the day’s result. Jurgen Roelandts (BMC) took the win, as all GC contenders remained together in the main bunch. That way, Valverde confirmed his overall win in the race -with Astana duo Luis León Sánchez and Jakob Fuglsang joining the Spaniard on the podium– and secured his third GC success in the race, after previous victories in 2004 –no less than 14 years ago– and 2007. The man from Murcia and his team-mates round off a fantastic win, after ‘Bala’ won stages in Albuixech (Thursday) and Las Canteras, Cocentaina (Saturday). Alejandro Valverde wins stage four in the leader's jersey. It’s Alejandro’s 111st success as a professional cyclist, as well as his first stagerace victory of the season, ten months away from the last one –the 2017 Vuelta al País Vasco– and seven months after his horrible cras in the Tour de France, one that was very near to putting end to his career. “This victory is a reward to the great, hard work we did during the last few months with my recovery. That’s why I’m so happy, because I know where I come from and everything I had to go through in order to bounce back from such a serious crash and injuries I sustained. It’s quite different, this feeling, from the one when I won the race for the first time, 14 years ago. This time I’m coming back from a very serious injury, a seven-month period without any racing, and it’s really comforting to see I’m doing as well as I did or even better. I had many things to show yet in 2004. Now I’ve done everything I could in cycling, even though I keep the same love and excitement towards this sport.